Gerry's wickets are designed in cooperation with the Norwegian Kennel Club and experienced dog judges. The wicket has undergone several improvements since we started in 2005. 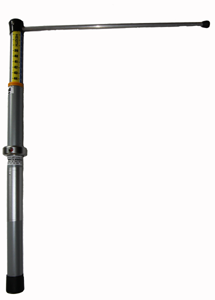 Today we present a measuring stick which has been very well received and meets most requirements. 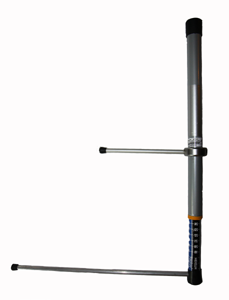 The new solution has 3 functions in one and will satisfy most needs: Height measure, breast measure and length measure. The length measure is optional because not all canines are measured by length. Gerry's wickets are made of anodized aluminum, lightweight and "suitcase friendly." A cheaper version is made of steel. Gerry`s wickets have a large intended audience. 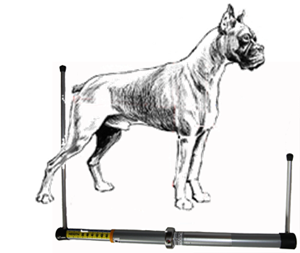 It is made primarily for dog judges, they are the main contributors to the development of the wickets. This is a useful tool in the assessment of the dogs. Many canines have drifted away from its original size due to the non-existence of suitable wickets. In future, we expect size and proportions to be more emphasized and measured. For dog clubs, breeders, and the eager dog owner this is also a useful tool that can be used from puppy to adult dog. The wicket is packed in a handy bag of imitated leather or fabric. (1) Height large dog. (2) Height small dog. (4) Length measure. (3) Breast measure.